We’re committed to ensuring the successful delivery of every aspect of your meeting. You’ll find our staff friendly, knowledgeable and helpful at all times. 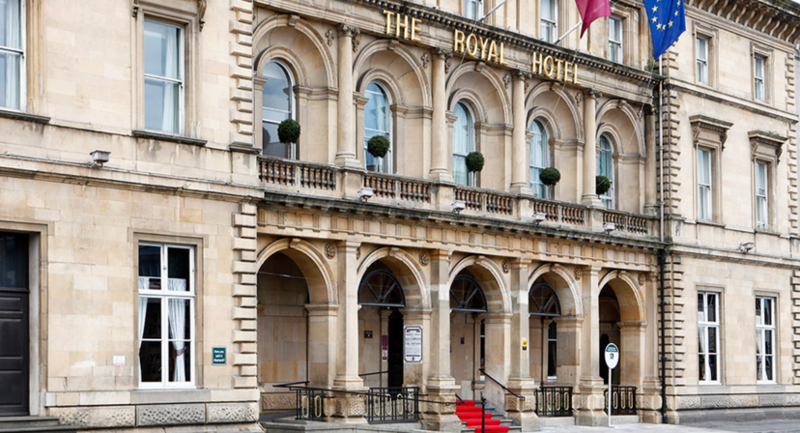 Royal Hotel Hull, with its iconic status as one of the central landmarks of the city, offers the splendour of Victorian architecture with a dramatic, luxurious and modern twist in décor and style. The location of the hotel makes it a great place for meetings, conferences and a whole host of social events. There are 9 fully functional meeting rooms, so whether you require a meeting room for 2 or an event facility for up to 450, Royal Hotel Hull can meet your every need. The Royal Hotel Hull is ideally located in the heart of the city centre, connected to Hull Paragon Train and Bus Station and within easy reach of the M62 motorway. The hotel offers onsite car parking (chargeable) for residents per night. All bedrooms are equipped with Flat screen TV’s with Freeview Channels, Tea and Coffee making facilities and complimentary Wi-Fi is available throughout the hotel. Your dedicated meeting planner will help organise every aspect of your day and ask the right questions to find out what’s important to you.